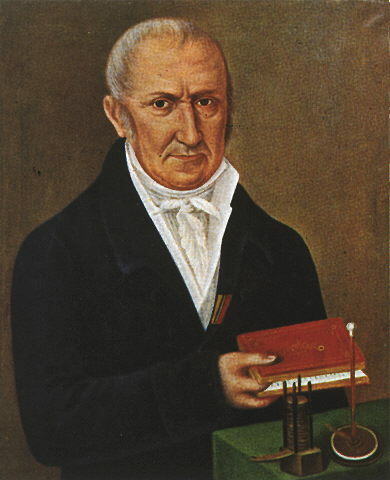 Count Alessandro Volta (1745 - 1827). Born in Como, Italy, into a noble family, Count Volta was a physicist and pioneer in the study of electricity. "Volt," named after Count Volta, is a unit of electric potential and electromotive force. Count Volta also made discoveries in electrostatics, meteorology and pneumatics. Volta, Alessandro, Count (1745-1827), Italian physicist, known for his pioneering work in electricity. Volta was born in Como and educated in the public schools there. In 1774 he became professor of physics at the Royal School in Como, and in the following year he devised the electrophorus, an instrument that produced charges of static electricity. By 1800 he had developed the so-called voltaic pile, a forerunner of the electric battery, which produced a steady stream of electricity. In honor of his work in the field of electricity, Napoleon made him a count in 1801. The electrical unit known as the volt was named in his honor. A pioneer in Electrochemistry. Volta became fascinated with the phenomenon of the age, electricity. The major feat of his life involved not static electricity, but dynamic electricity- the electric current. Following the experiments of Galvani, who was a friend of his and sent copies of his papers on the subject, Volta attacked the question of whether the electric current resulting when muscle was in contact with two different metals arose from the tissue or from the metals. In 1800 Volta virtually clinched the victory by constructing a device that would produce a large flow of electricity. Volta's device was an "electric battery"- the first in history. The invention of the battery lifted Volta's fame to its pinnacle. The unit of electromotive force- the driving force that moves the electric current- is now called the "volt." Volta's first important invention was the electrophorus (1775), a device capable of passing an electric charge to another object. His most important discovery, though, followed the experiments of Luigi Galvani on animal electricity: Volta's "voltaic pile" (1800) provided proof that electricity could be conducted through and produced by non-organic matter. In the following year, he was created count by Napoleon. On the 20th of March 1800, came one of the greatest breakthroughs in the electricity experiments. A professional disagreement, over the results of an experiment, between Luigi Galvani and Alessandro Volta, two leading scientists, led Volta to prove that when certain metals and chemicals come into contact with each other they can produce an electrical current. He placed together several pairs of silver and zinc discs separated by paper soaked in salt water and an electrical current was produced. Volta had produced the first battery.. Physicist, b. at Como, 18 Feb., 1745; d. there, 5 March, 1827. In 1769 Volta published his first paper, "De vi attractiva ignis electrici", which attracted attention and helped to secure for him his first public appointment, professor of physics in the Liceo of Como (1774), a position which he held until 1779, when he was elected to the chair of natural philosophy in the University of Pavia. The twitching of frog's legs under electrical stimulus, discovered by Swammerdam in 1658 and re-discovered and described by Galvani in 1786, occasioned a memorable controversy as to the cause of the convulsive movements; after years of discussion the "animal electricity" of Galvani was superseded by the "contact theory" of Volta. In seeking further experimental evidence in favour of his contact theory, Volta was led to the greatest of his inventions, the voltaic "pile", which he described in a communication of 20 March, 1800, to Sir Joseph Banks, President of the Royal Society of London. Consisting as it did of a number of discs of zinc and copper separated by pieces of wet cloth and arranged in a vertical column; a more efficient arrangement was, however soon found by Volta in the "crown of cups". The voltaic battery of 1800 marks an epoch in physical theory as well as in the application of science to the welfare of mankind. In 1780, Volta's friend, Luigi Galvani discovered that contact of two different metals to a frog muscle results in an electric current. Volta began experimenting with metals in 1794 and discovered animal tissue was not needed to produce a current. This discovery led to many conflicts with animal-electricity adherents and the metallic-electricity advocates. However, when Volta created the first electric battery, he proved to have won. One year later, Alessandro Volta demonstrated his battery's generation of electric current to Napoleon in Paris and he was made into a count and a senator of the kingdom of Lombardy. The emperor of Austria made him director of the phylosophical faculty at the University of Padua in 1815, 12 years before the day he was to die. The world's first battery -- the voltaic pile -- was one of the most significant inventions that emerged during the Scientific Revolution. In the world of science, the most significant of all the forces is that of electricity. Science, in general, has enabled the human race to better understand how these things that make up our world exist, move and change; but it is the discovery and application of electricity that has become the single most influential contrivance of the twentieth century. Alessandro Volta was born on Febuary the 18th, 1745 in Como, Lombardy and died, 82 years after on March the 5th, 1827, also in Como, Lombardy. Italian physicist who constructed a device for accumulating a large charge by a series of inductions and groundings.